Whether you are just beginning to accumulate wealth, or are enjoying retirement, we can be a helpful resource making sure you are comfortable progressing through your financial stages. With no account minimums, sales commissions, internal "production requirements" or overarching corporation, our only interest is to best serve our clients for the long-run. We have seen the high's and low's, and know how to best navigate our clients to achieve their long-term financial goals. Answering Any Questions You May Have. Let's Get Started! The first step begins with a simple conversation. From there, the possibilities are endless!
" 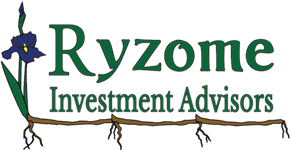 Let's Grow Together "
Welcome to Ryzome Investment Advisors. We are glad you're here! Our mission at Ryzome is to enhance the lives of those we work with. By developing strong, long-term relationships, we understand what’s important to our clients and are able to apply our knowledge and experience to navigate them toward financial success, however they define it. Let’s start with a common question: Why “Ryzome” and how does that relate to what we do? In botany, a rhizome is a constantly expanding network of roots that grow horizontally (against the force of nature) underneath the surface. These roots are connected periodically by ‘nodes’, which serve as a hub and provides nutrients to the root system, allowing it to remain strong and continue growing. Our goal in our partnership with you is to stay connected, continue growing, and not just survive life’s adverse situations, but to thrive through all conditions, as well as be your resource for holistic financial education. When a rhizome is separated into pieces, each piece can give rise to a new plant and root system, making it a versatile and resilient method of growth. Whether you are new to the planning process, or already have something in place, we’d like to understand your goals and offer guidance along the way. We aim to serve as a resource regarding all financial needs; be it budgeting, investing, taxes, insurance reviews, retirement or estate planning. In this sense, we feel a rhizome is a fitting symbol of the role we hope to play in your financial endeavors. A few examples of plants propagated this way include irises, ginger, bamboo, asparagus and lily of the valley. And that's how (and why) we are Ryzome Financial Advisors! With 3 full-time Registered Investment Advisors to serve you, we tailor our advice to suit your unique investment plan(s) and meet your specific needs with an individualized approach that includes regular reviews and conversations. We do this because we care and because we know and understand it! Through all market conditions, we enjoy sharing it with you. So, please, take a few moments to look at our site to find information we think will help. And if you'd like to learn more, please reach out to us. Thank you - and we look forward to talking with you soon!